The Harker Forensics program has a proud tradition of excellence and competitive success. Over President’s Day weekend, we had some particularly spectacular results that merit special recognition. One hundred twenty-seven Harker upper and middle school students competed in speech and debate events at the California Round Robin and the California Invitational at UC Berkeley. The California Round Robin is an elite tournament where some of the best debaters nationwide compete by invitation only. The California Invitational tournament had 2,064 entries from 197 schools from 26 states and five countries. In Public Forum, seniors Maneesha Panja and Sebi Nakos took first place in their pools while senior Jithin Vellian and junior Nikhil Kishore took second, causing them to meet in the semifinals. Panja and Nakos advanced and were named champions in Public Forum Debate. Nakos also was named third overall speaker in the division. In Lincoln-Douglas Debate, junior Pranav Reddy and senior Srikar Pyda both placed first in their respective pools. Pyda lost in the semifinals, but Reddy was undefeated and named tournament champion. The combined success of all members of the team earned Harker first place in debate sweepstakes and third place in the speech and debate combined sweepstakes. This is a huge accomplishment and all of the students played a part in helping Harker achieve this recognition. In Lincoln-Douglas, Pranav Reddy won 13 consecutive debates at the tournament, beating out 280 competitors from across the country to be named the champion of one of the largest and most prestigious tournaments in the nation. 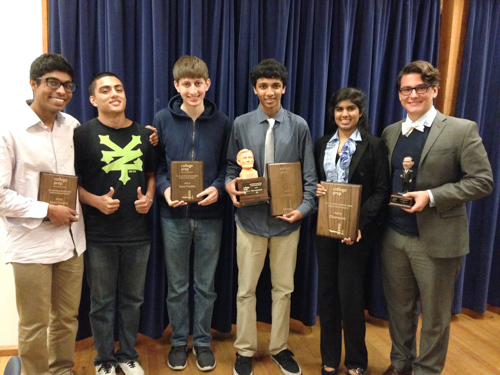 Reddy is the first student in the history of the Harker Forensics program to win this event in Lincoln-Douglas debate. Reddy’s national dominance was further highlighted in early February by his victory at the Golden Desert Invitational at the University of Nevada, Las Vegas. In Public Forum, sophomore Eesha Chona and freshman Joyce Huang advanced to finals, losing a close decision to Presentation High School. Chona and Huang beat out a field of 190 teams to reach the finals. In Congressional Debate senior Saachi Jain was also a finalist out of more than 130 competitors.